Time for a Christmas lesson! Tis the season to be jolly—and what is jollier than measuring fun with Santa’s Christmas Elves? Measurement is a huge topic in fourth grade. You’ll see your students move from the measuring and recording they did in previous years to something much more involved: manipulating data measurements and switching between units. Is that fun? Well, it can be! Taking your whole class on a journey to the North Pole workrooms is one magically fun way to give your students a first look at how data conversions work in the (almost) real world. Because it’s important a fourth grade Christmas lesson be engaging. During the days before Christmas break your students’ interest will caught by what is happening outside the classroom, and it’ll be hard to get them to concentrate on dry facts and ordinary problem solving. That’s when a lesson like this one comes in particularly useful—a fun and engaging story lesson that will make even your most listless fourth grader sit up and pay attention. Math isn’t optional in Santa’s workshops. Here the ability to switch between larger and smaller units describing the same material is essential to bring understanding between the elves who work in the inner courts, mixing and measuring, with the ‘outer regions’ elves who are responsible for bringing in raw material and calculating delivery details. Christmas is approaching, and the activity in Santa’s North Pole workrooms ramps up day by day. Some elves are busy in the inner chambers of Santa’s workshop. They’re doing delicate work that musn’t be interrupted, and during the month of December they’ll work from morning to night. Hazelnuts and ginger nuts, brought in by the North Post doves, are all they get to eat while on the job; and the cold glacial water keeps them awake and alert. Another group of elves has a very different job: scouring the earth for the raw material that Christmas treats are made of. These elves are nimble on their feet, and they’re able to climb down mountains, shinny down caves, or scrumble through jungles looking for whatever might be needed out in Santa’s workshop. Some even go on galactic missions, with a little help from Santa’s flying reindeer. There’s only one problem, and that has to do with the language the different groups of elves use. The outer elves measure their raw material with large measurements—kilograms, pounds, meters and feet. If they talk about time, they talk about hours. The inner elves are much more precise. Instead of kilograms, they do their work with grams. They use ounces instead of pounds; and measure with centimeters or inches instead of meters and feet. When they talk time, it’s minutes or seconds. That’s why there are conversion tables posted on the walls in the areas of Santa’s workshop where inner and outer elves meet. These are lists which interpret one measurement in terms of the other. 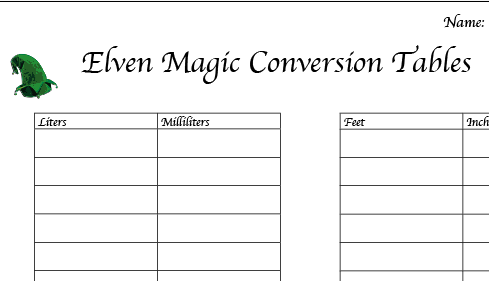 Our job today is to help out the elves by making some of these conversion tables. The first elf we’re going to help out is a clever little fellow called Crusel. He’s in charge of a candy making room, and he spends his days making and tasting extra-wonderful candy for children that are marked down in Santa’s book as extra-special. Just now he is focusing on candy-canes. Pure white sugar, bright crimson coloring, and delicious peppermint oils are all brought to him by Ranger Elves; and since they measure in pounds and he only knows ounces, he needs a conversion table posted by his door to make ordering his ingredients straightforward and easy. Does anyone remember how many ounces went in one pound? Yes, 16! Prepare a two column table on the board; with ‘pounds’ and ‘ounces’ as the headings for the two columns. Write down 1 and 16 as the first row in the table. Then write 2 down underneath 1. 1 lb was 16, so 2 lb will be 16+16, or twice 16. Go on to three, four, five, and six, asking the class to provide the answers and the reasoning behind it, and filling in the table as you go. If you feel your students need the practice, you can continue the table up to ten. Now, if he needs 64 ounces of crimson color, how many pounds must he request? Orlian, in a little underground chamber, uses fresh milk and butter along with flavorful cocoa powder and crystal sugar to produce delicious Christmas chocolate. He likes to do all his measurements in milliliters; using a set of glass measurement cups and beakers his elf grandmother left him, but the elves that bring him his ingredients don’t like to deal with anything smaller than liters. Can you make a conversion table for his door, so he’ll know how many liters to request when he’s got an order—in milliliters—ready in his head? Pass out the worksheet, and guide your students into filling out the first two squares. Then give them a few minutes to fill out the rest of the table, walking around the room to help anyone that needs help. Looking at your table, can you tell me how Orlian will request 4000 milliliters of fresh yellow butter? How will Orlian request 5000 milliliters of good new milk? If the outside elves brought him 7 liters of crystal sugar, how many milliliters would he have ready to use in his recipes? There’s one more workshop I’d like us to visit today. Here Kruskru the elf is hard at working making sleighs for little boys and girls to play in the snow with. His ruler is in centimeters and inches, but the elves who bring him his wood and steel only have rulers that measure in feet and meters. Can you fill out this next table to help him convert between feet and inches? Start with one foot—does everyone remember how many inches that is? Very good, twelve! So one foot in the first box, and twelve inches in the next. Now go to the next line, write ‘2’ under feet, and write down the number of inches in two feet in the next box. Give your students some time to complete their tables, and, if class size permits, glance over their work when they are finished. If Kruskru wants a 24 inch piece of wood, how many feet will he ask for? If a woodcutter elf brings Kruskru a seven foot piece of wood, how many inches long will it be? If you have extra time, stage some play acting. Let half of your students be workshop elves, and the other half rangers. Pair them up, and give them each dimensions to work with: gallons and quarts, ounces to pounds, seconds to minutes. Let the pairs work together to make conversion tables or let them work together in larger groups if there is less time. Then set a few problems to each pair/group. This is just one of many lesson plans available on Mathwarehouse.com, your new favorite website for lesson preparation. You’ll also find a host of other math teaching resources, like our Visual Fraction applet for those fraction lessons or the handy grapher for when you and your students dig into graphs of all times.